As a result, the New York-based boutique financial institution recently hit a significant milestone: Since launching LoanPay last November, The Upstate National Bank has already processed more than seven figures in electronic payments with LoanPay. Chad E. Wright, the bank’s Vice President of Accounting and Information Systems, anticipates even more clients adopting LoanPay throughout 2018. CheckAlt’s LoanPay is a highly flexible technology allowing financial institutions to accept payments across multiple channels for any type of loan, including auto loans, mortgages, business loans, and more. Online and mobile banking integration of LoanPay is seamless, with fully hosted or single sign-on options. Wright and The Upstate National Bank team have worked closely with CheckAlt on a feature in the next version of LoanPay: the ability to create householding accounts. Householding allows clients to access multiple loans and make payments from a single login. This feature solves a challenge The Upstate National Bank has faced in managing payments from clients with at least 50 loans outstanding. “I think we are going to easily pick up another 10 percent, if not more, once that feature is in place, because a great number of our clients have several loans with us and they are spread across several entities,” Wright said. 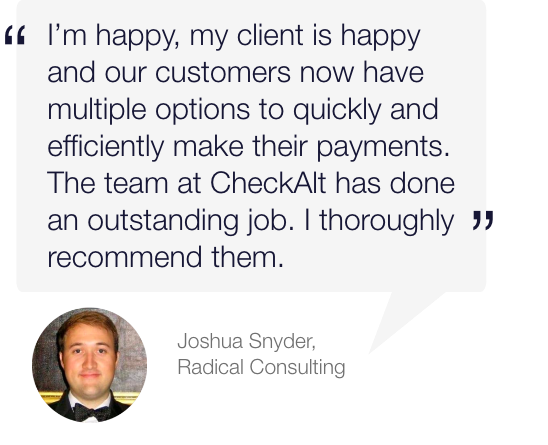 To learn how your financial institution can benefit from CheckAlt’s LoanPay solution, schedule a demo with us here.